On March 2002, Denzel was imported from the Saredon in England. And then he went to the U.S.A. on December 2002, campaigned by Gabriel Rangel to his American Title. After winning the JKC, Int. 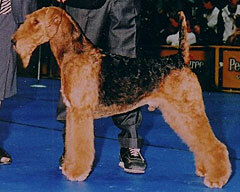 Champion title in Japan, the dog participated in dog shows in England and finally became the Eng, Champion. On August 4, 1997, the dog was imported from the Saredon in England. 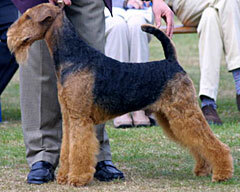 From the first entry in a dog show in 1996, the dog has gotten 7CCs, 3RCCs and 1BIS, and contributed to improvement in quality of Airedale Terrier in Japan. He came to Japan on December 1999. 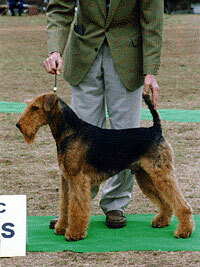 He became the Top Airedale in 1998 and 1999 in succession. He has gotten several BISes and 13CCs. He made a great record in the Airedale history. He is the masterpiece of Saredon's home breed. 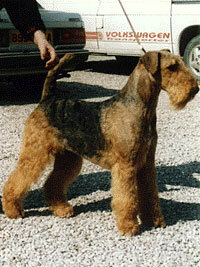 After winning a champion title in England in a short period, the dog came to Japan on February 17, 1992. 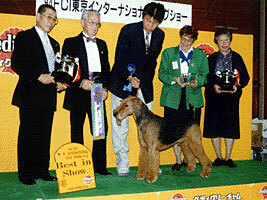 The dog became the Best in Show in the FCI Tokyo Inter-All-Breed Dog Show in 1994.